Tight acoustic traditional American ballads followed by a rowdy electric set of original and trad tunes. Since 1986 - before the post-punk boom of the early '90s and way before the post-O Brother folk boom of the early 2000s - Cordelia's Dad has led a double life playing both inventive noisy rock and inventive acoustic Americana. Sometimes that's meant an acoustic set at a plush-seated art center followed by an electric set at a sweaty rock club a few hours later. Other times it's meant banjos and ballads opening for a band like Nirvana and howling sheets of electric noise at an unsuspecting folk festival. 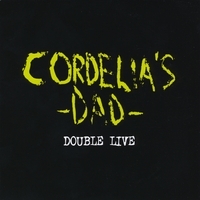 But from the beginning, a Cordelia's Dad show has usually been both - very acoustic and very electric in two sets, which is what you get here for the first time in album form. This recording is dedicated to everyone who has supported the band over the years by coming out to shows, playing our music on the radio, writing about us, writing to us, telling their friends, showing us how to hold a fiddle, taking us for a tour of the observatory, giving us a place to crash and/or buying us a sandwich. Thank you! The best is yet to come. Recorded to multitrack by Dan Richardson at the Iron Horse Music Hall April 29, 2007. Mixed by Mark Alan Miller, Slaughterhouse Recording. Master by Dave McNair, Scott Hull Mastering.